Last Thursday in Oakland, California, we celebrated a major victory for worker health and safety: our state became the first in the nation to pass a regulation preventing workplace violence. As a leader in progressive health and safety laws, our state will set the example for other states to follow - and hopefully, the entire country. The Occupational Safety and Health Standards Board (OSHSB) heard heartfelt and compelling testimony from health care workers. Workers, staff, and other allies with the California Nurses Association, SEIU 121RN and NACA, UNAC/UHCP, and more, came to express their support for adopting the standard. Speakers came from around the Bay Area; others traveled from as far away as San Luis Obispo and San Diego. Dozens upon dozens of workers courageously recounted their personal stories of workplace violence – personal accounts of being verbally assaulted, threatened, and even physically battered. 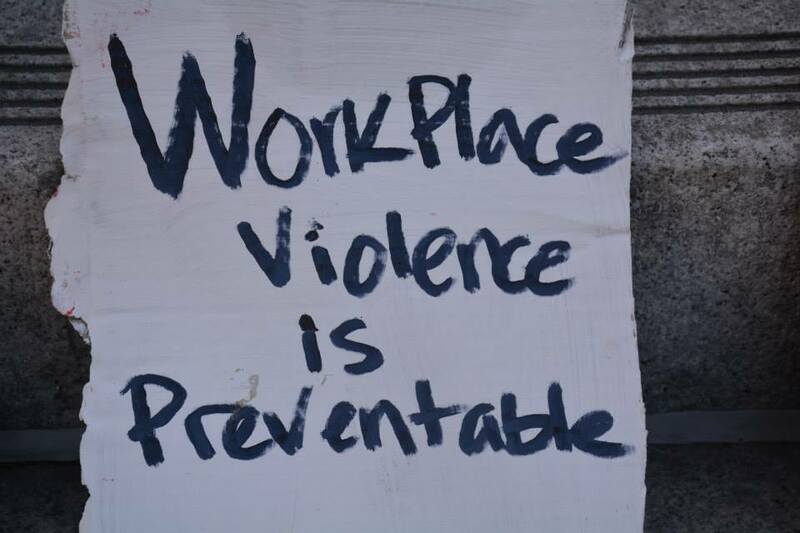 Many testified that workplace violence can simply no longer be tolerated as a part of the job. All of them echoed the need for a workplace violence prevention standard that includes interactive training, prevention procedures, and response procedures. Worksafe’s Nicole Marquez testified to highlight the tragic and preventable deaths of two healthcare workers -- Cynthia Barraca Palomata, a nurse in the Bay Area for over 20 years employed by Contra Costa County Jail, and Donna Gross, a psychiatric technician at Napa State Hospital. She also testified on the need for health care workers to have the proper tools and training to recognize and protect themselves from potentially dangerous work environments. Ms. Marquez also noted the importance of this standard as an important precedent for expanding workplace violence protections to all workers. Each Board member addressed the hearing room to express why the standard was so important for worker safety. Board members also shared with deep sincerity how the healthcare workers’ stories revealed a true crisis in the health care profession - that violence and danger are pervasive in the workplace. Upon the closing of the Board’s remarks, they unanimously voted to adopt the standard. Worksafe is honored to have played a part in this historic victory. We thank all the state agencies involved and the stakeholders. We especially thank and applaud the efforts of Service Employees International Union (SEIU 121RN), SEIU Nurse Alliance of California, California Nurses Association, UNAC and others for their steadfast advocacy on behalf of health care workers in this state. Most importantly, we honor the lost lives of Ms. Palomata, Ms. Gross and the many others who have been attacked or killed at work. It is for those who have fallen that we continue to fight for the living.